A Many Centenary Birthday! « John Bartram Lives! 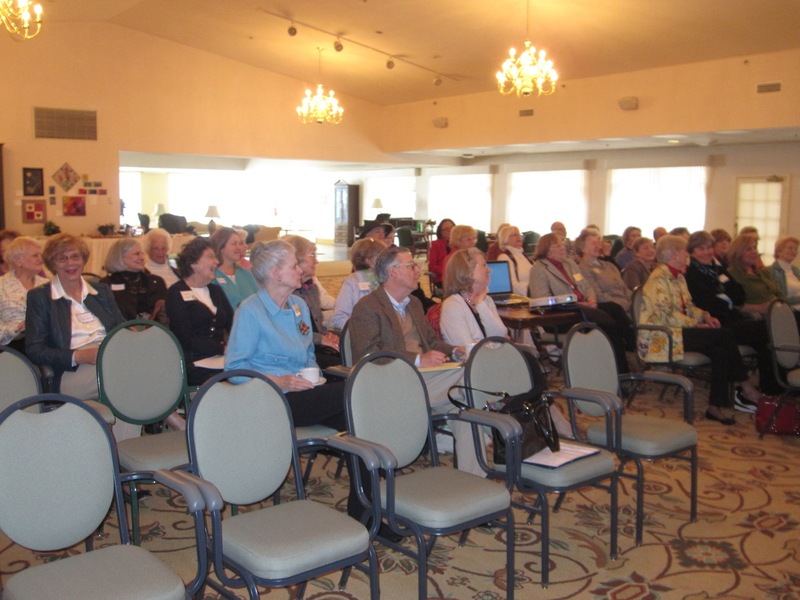 The Junior League of Philadelphia celebrates its centennial this year. Philadelphia is home to such a large number of honored and ancient associations that it would be curious to investigate whether there is any year forthcoming in which some group or other is not celebrating a centennial…or a bicentennial…or a sesquicentennial…or an any-than-many-centennial. When you lose count of the number of multiples of 100 that an association has been incorporated, perhaps it’s time to stop counting and go back to look at what the association was originally committed to promote. So I believe that it is important to note the passing of important milestones; not so much to be self-congratulatory and smug, but as a way to call to mind why it was so important to meet and discuss things over a nice meal in the first place. I greatly enjoy a nice meal with pleasant company that presents the opportunity to exchange ideas and ponder deeply. Also, I just like to hear myself talk. Ask my fine cook and wife if you don’t believe me. I’ve finished celebrating my tri-centennial twelve years past already. I enjoy when people try to date me. Perhaps it’s easier to date a rock. Perhaps the Pyramids are more memorable. Perhaps the Acropolis is a better architectural statement. Perhaps the Venus de Milo without her arms and head is a prettier picture than my sags and bags and wrinkles. But then again, perhaps the memory of a fine day in the country amidst a group of fellow luncheon guests means more than the easily noted but soon forgotten thoughts what might have been better. It is enough said to appreciate the wonders of being alive and in good company. As John was relating his historical adventures the crowd sat politely silent and appeared to attend his tale. I was introduced to any and all who wanted to speak with me. The day moved quickly through its paces. 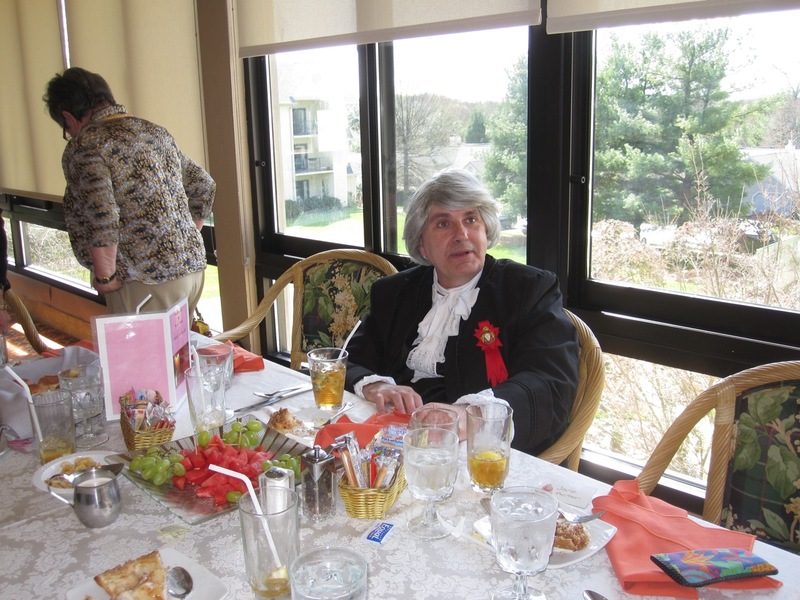 The president of the club is Ms. Graham Boose. She was grace itself when I accidentally took the seat promised to her at lunch. It is my oafishness and lack of social etiquette that always prompts me to take the center stage and seek the strongest spot light. My apologies go to her as I reflect on the minor contretemps that occurred over my disregard of the formalities of the day. 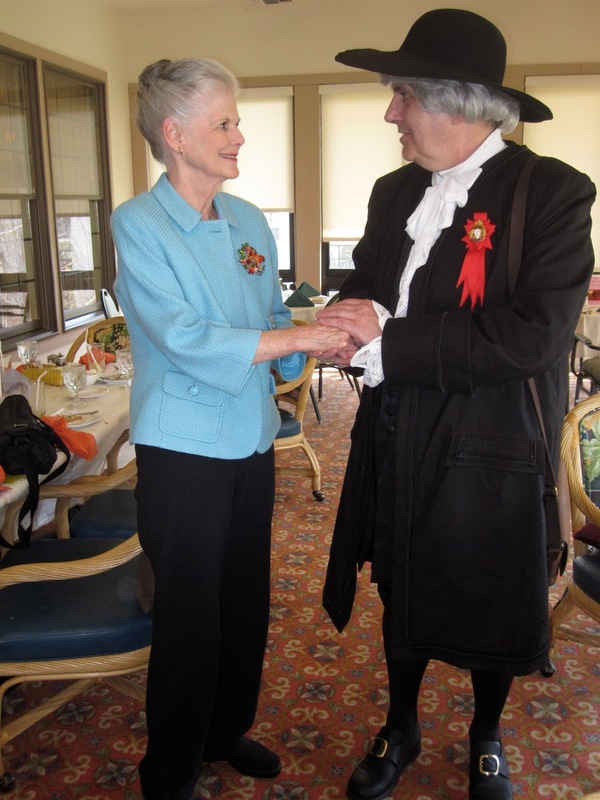 John Bartram shared conversation with the President, Ms. Graham Boose. 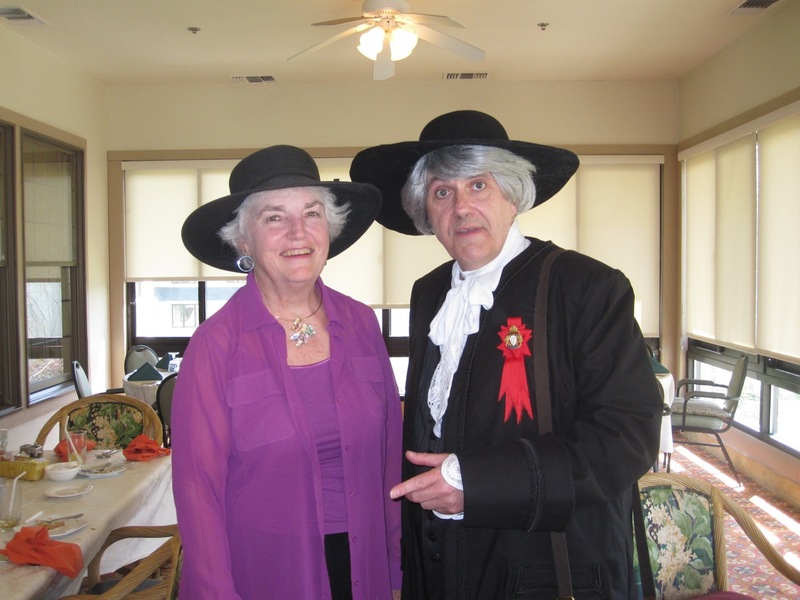 A horticultural historian in the group, Ms. Mary Cloud Hollingshead, came prepared to best me in my challenge to always appear with the most outstanding hat. I grant you that my striving for superiority is not in the Quakerly way of being humble, but then they were not welcoming of my opinions in all those years past. I think I might be forgiven for a bit of harmless pride in the scale of my hat! It has need to fit a large head after all. 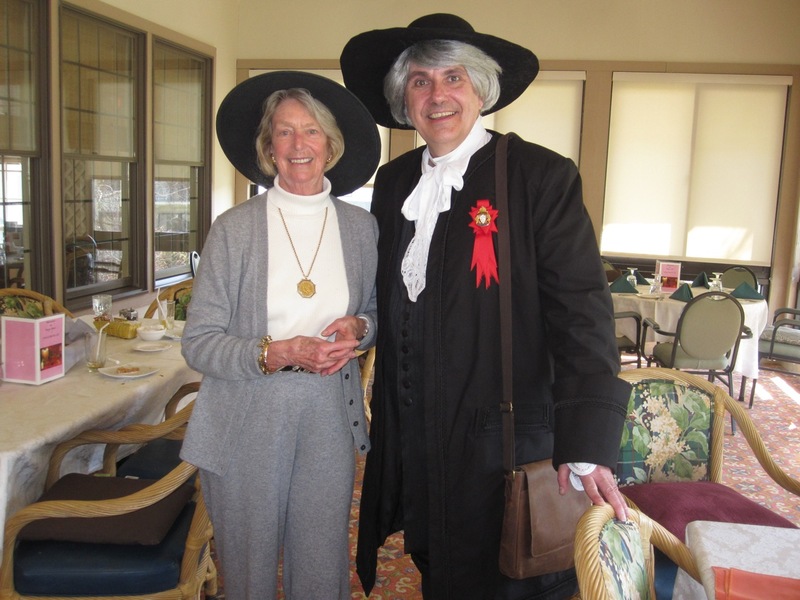 Ms. Mary Cloud Hollingshead regaled John Bartram with stories of his own travels. I was very impressed! The lady to whom I owe my thanks and gratitude for the invitation to share my story is Jane Acton. She is the chairperson for programming. Her charming notes and contacts over the many months leading up to the day were some of the most memorable of my experience. It was truly an honor to be considered for this particular time and place. Jane and John ending the afternoon with a contest of hats. I love hats! I leave you with the thought that a celebration of 100 years is special. Praise goes to any group capable of staying the course and successfully struggling with the vicissitudes of life that challenge us all just to get up in the morning. Even more, I want you to think of my own personal journey of discovery during my own collection of 312 years past. Come my next birthday, forget the extra candles and give me more butter cream icing with raspberry jam spread thickly between the layers. Life is–and always should be–very sweet at birthday celebrations! 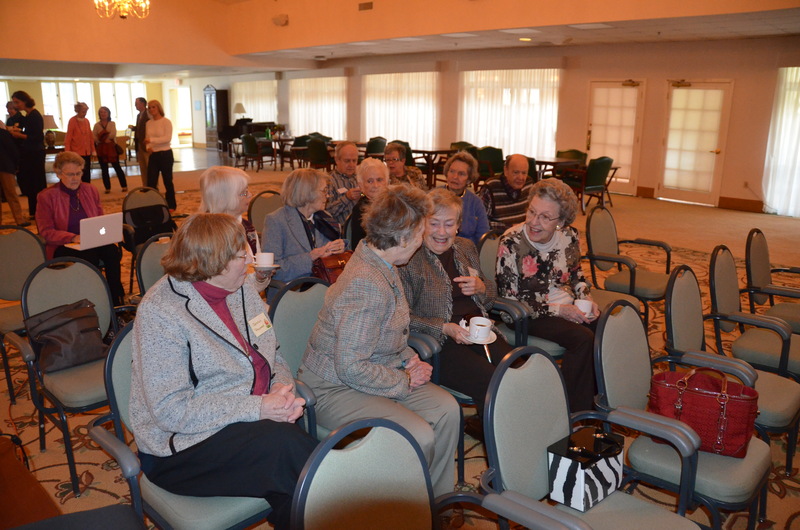 The audience takes its seats for the afternoon's lecture to begin.